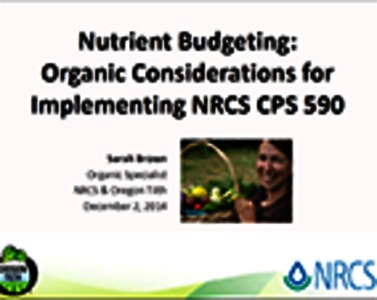 This webinar is focused on nutrient management on organic systems. It is addressed to US farmers, especially in the part dedicated to regulations. Agronomic information presented by the relator will be useful also for European organic farmers, both experts and newcomers. It is organised in sections: US regulations; evaluation of crops nutrient requirements; evaluation of nutrients release from organic matter, amendments and cover crops; fertilization, timing and application methods; leaching and runoff risk. Data values are presented in US units of measure: pounds per acre. The conversion factor to kg per ha is nearly 1 (1.12), so quite straightforward. Methodology to assess nutrient balance from crop requirements and nutrient credits from soil organic matter, cover crops and amendments.